Nathan R. (USA). I could be super secretive about my last name except I give it away below. No cyber-stalking please! 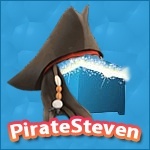 Like others, my username is the same one I have used on other boards, forums, games, etc. Back when my wife and I shared an AOL account in 1997, we created ndemrose. ND are my first two initials, EM are my wife’s initials and Rose is our last name. 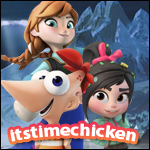 I heard something about DI around the beginning of 2013 and thought that it sounded really cool, different Disney characters playing together for the first time and being able to build game worlds from scratch. Since purchasing, playing and collecting, it’s definitely a fun game to play with tons of potential. I really enjoyed playing The Lone Ranger play set. I think the reason I really liked it so much is because I played the entire play set with my 8 year old son. We had played the other play sets off and on, both together and separately, but this was the first time we played an entire toy box from start to finish together and in one sitting (completing all the challenges and earning all the stars too). Of course, things got serious once we earned the spirit warrior and spirit horse powers and could attack each other from afar! Plus, we both really liked the movie! Yes, it was a little long, but still a lot of fun! If I really had to pick one, it would probably be Mr. Incredible, only because he’s the dad of the family and so am I. Anymore when I play, I look for a character that needs a level or two and play them so our Hall of Heroes can be full of gold statues. Seriously though, I’m constantly thinking of new characters that would be exciting to have in DI, while not duplicating existing powers or actions. While there is flight, no one flies 100% of the time. So anyone from Planes would be a good addition. Maybe Kevin from Up or Nigel from Finding Nemo? Also, no one swims either, so anyone from Finding Nemo or The Little Mermaid would be good too. First and foremost, I say to myself, do I have time to enter? 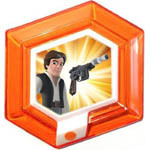 I like that DI has begun to pre-announce challenges for a month, giving us more time to create better toy boxes. But with real world commitments, I find it hard to sometimes get in the mood. I do however, have a spiral bound notepad, full of toy box ideas. Usually, if I get an idea for a level, I write it down and plan it out before I even turn on DI. Like I used to say when I was in the Navy, proper planning prevents poor performance. I just flipped through my notepad and counted about 25 different ideas that I have in various stages of completion; ranging from just a title and idea, to fully detailed levels with logic all planned out. Once I have an idea fleshed out, I start with the logic components first (if any) to ensure they fit in the toy box. 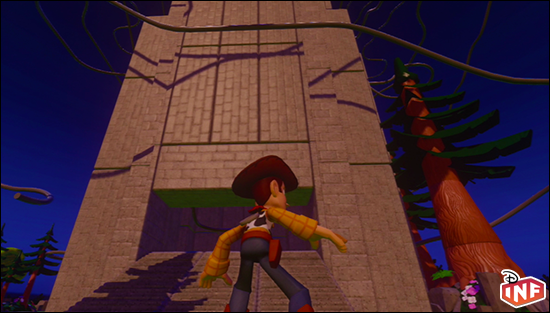 There’s no sense building a beautiful and huge level, only to not have room at the end to do anything with it. Then I test it, test it again, and retest it. I had a toy box that I created for the Valentines Day challenge that involved numerous replayers, timers, triggers and counters. I had to imagine different scenarios for each level I made. As it involved shooting targets while being time and getting to a specific number before moving on, I had to plan for each scenarios. How to start each level? What if you didn't hit all the targets in the allotted time, then what? What creativitoys are affected and how and in what order? A lot of “what if’s” to be answered and anticipated. Once that’s done, I can complete building the world, adding finishing touches. And of course, one last run through, just to ensure a replayer didn't break on me somewhere around the line. Of course, once that’s done, then hard part comes. Naming the toy box and giving it a description without going over the character limit! I’ve only had two toy boxes featured, Save the City and Tangled Hair. Save the City took me 25-30 hours, not including the time I broke some of the repeaters and had to go back to an earlier edition of the toy box. I built this toy box prior to a specific challenge being announced, so I had time to build, refine and tweak it. Tangled Hair on the other hand took me only a handful of hours, maybe 5. I didn't have any plans to enter the Tangled challenge, but a day or two before the challenge ended, I decided to enter. So I threw it together on my iPad (first time doing that) and submitted it. I was very surprised to see it got selected. With only two featured toy boxes, I don’t have a patented specialty yet. I would like to think that I try to do things that haven’t been done yet. My Save the City level was one of the first toy boxes that featured the Incredibles (I think). 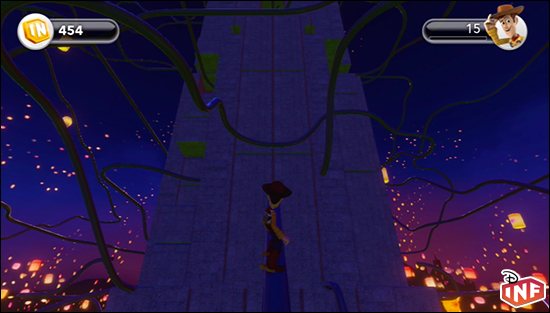 And my Tangled Hair made use of railing for the majority of the level, another first I believe. I've got an idea for the Princess challenge, and without giving away anything, I definitely have something new planned for it! Hands down, it has to be Save the City. I knew I wanted to have a secret base that any of the Incredibles could be based at. I had several floor designs planned out, and changed it several times before arriving at the finished product. Then I created the secret entrance/exit and other features of the base, including the hangers for the Incredi-copter and Incredi-car, the “computers”, and the trophies for finished missions. After that, it was a matter of building city blocks so that no two were the same, as well as adding the city park and the sports stadium. There are too many to name! Each week I am in awe of what the community creates, especially fellow DIF members! I have so many toy boxes on my Wii U, but have only submitted one other for a challenge. 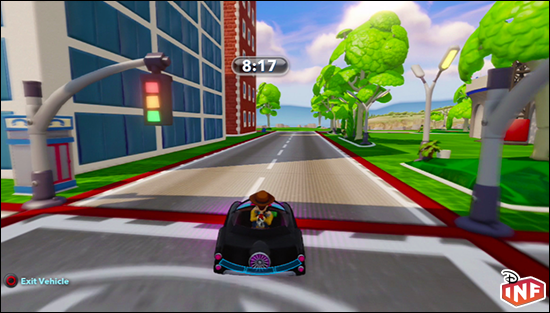 It was a fairly accurate recreation of the Autopia for the Disney Parks challenge. It had two fully functioning race tracks that intertwined around each other, just like the actual ride at Disneyland. Each turn, curve and twist was faithfully recreated, and there was even the Matterhorn to one side. You could even drive the Autopia cars. Unfortunately, it was only a race track and didn't get selected. I wish! I barely have any room left to add any more items when I finish a level. 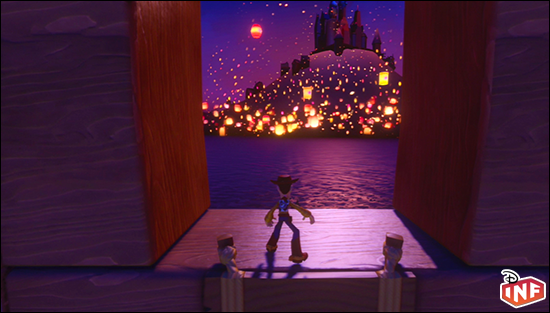 If I did though, I would probably add a hidden Mickey to each toy box. Like many others, when we went to Disneyland, we played the hidden Mickey game the whole time we were there. I swear, we were seeing Mickey’s hidden everywhere, even in our sleep! That would be my Valentines Day challenge toy box. The idea was to start in a central location, surrounded by canyon walls. Only a single cave to go through, which led to the first level. At this level, you were given a weapon (I think I used the MU paintball gun) and had to shoot 5 targets shaped like hearts in one minute. Finish it and a new cave appeared, leading to level two. 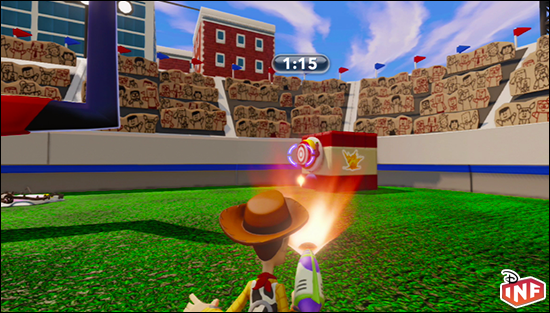 The second level, instead of the paintball gun, you used the slingshot, but the same parameters. 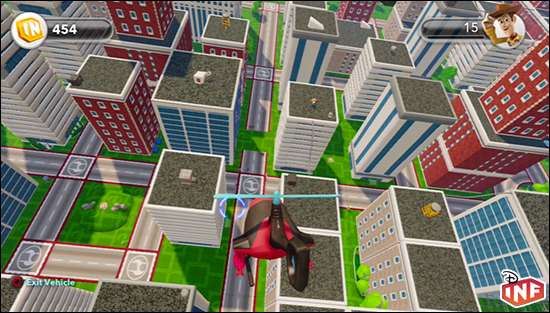 The third level was similar to the first, but instead of remaining stationary, you had to ride railings and shoot at the same time. There is a pattern emerging here, with each level being what I thought to be progressively harder. The fourth level, instead of railing, you rode on conveyor belts and aimed at heart targets. The fifth level was more of an obstacle course, with turrets shooting at you as you shot at the targets. Finally, if you finished all five levels, the final level opened up and it was a combination of all the prior levels all at once. I created the entire toy box on my iPad app, testing as I went and had what I thought was a finished product. I wanted to test it on my Wii U, so I uploaded it and launched it, only to find it was too full on my Wii U when I had room to spare on my iPad (weird…). Being so full, repeaters broke and wouldn't playback correctly. So, with 20+ ours wasted, I almost threw in the towel, but decided I had enough time to redo the level entirely, making it smaller with less items. Again, I built on the iPad app, which I find is much easier than manipulating objects on the console. I redid the entire level, had room to spare and loaded it to play on the Wii U, but again, something was lost between the two systems and entire sections of my toy box was lost. Unfortunately, I didn't have time to fix it and didn't submit it, but I definitely learned that smaller is better. This comes from my Tangled Hair toy box. So, first I made Rapunzel’s tower out of blocks, then I added the railing. The first few levels up weren't too hard, but as I went up and up, the railing got harder and harder to place, since I was running out of space. Plus, I didn't want to make it too hard to get to the top, sort of like Chutes and Ladders. I think I ended up putting a total of 20 different railing sections in, and while you could take any number of railings up, only one railing took you to the very top. I had my 11 year old daughter beta test the level for me, and I kid you not, she went up, up, up and up and finished the toy box in about 1 minute! Huh? I just spent all this time making this, thinking it was hard, and she finished it so quickly. We definitely laughed hard at that together! Whoa... somebody who actually liked The Lone Ranger movie. I almost had the same experience... usually my nephews got bored with every playset after messing around in them for a few hours... except the TLR one. Must be the horses... IMO it is hard to get bored when you get to ride a horse everywhere. I enjoyed the TLR playset so much I actually went ahead and braved watching the movie ... I didn't last 10 minutes before I started scanning ahead... I barely made it through the movie even at 2x & 4x speed I think. ...the one with heart targets everywhere... such a cool idea. ^ IMO they should interview Allison... I mean she's community manager... I think they are supposed to do stuff like this... social media/community outreach, etc. I mostly just want to know which user made toy box is her fav though... since Rapunzel is her fav character I think there is a good chance her fav toy box will be a Rapunzel toy box.